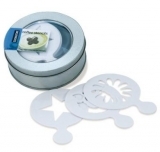 Aerolatte Mooo Milk Frother is the easy way to foam milk for perfect cappuccino, milkshake or hot chocolate!. Fill one third of a tall mug with hot (not boiled) milk. For cold drinks, ensure the milk is fridge cold. At a slight angle, insert the aerolatte whisking head into the milk and down towards the mug's base. Switch on for about 20 seconds, slowly stirring the whisking head from the bottom towards the top of the mug. Remember to switch off the areolatte foamer before removing it from the milk. 1 x storage case for home or travel. 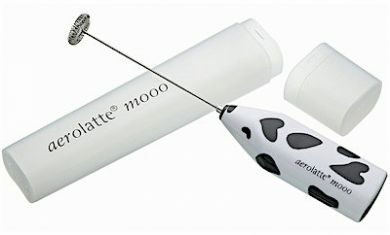 Sorry - We are out of stock of Aerolatte - Mooo Milk Frother.